Join us on this exciting journey of discovery that will satisfy your senses and provide exceptional photo opportunities. Our first stop is near the world-famous icon of Hawaii, Diamond Head Crater, where we stop at the Amelia Earheart monument which overlooks the Pacific Ocean as the 100.000 year old volcanic crater towers above you. Our island discovery continues with the beautiful Hanauma Bay, a pristine marine eco-system with colorful living coral reefs and beaming fish and marine life. Travelling along O’ahu’s spectacular southeast coastline we arrive at the famous Halona Blowhole and “From Here to Eternity” beach where Green Sea Turtles can often be spotted in the emerald green waters of the cove made famous by the only Oscar-winning movie made in Hawaii. 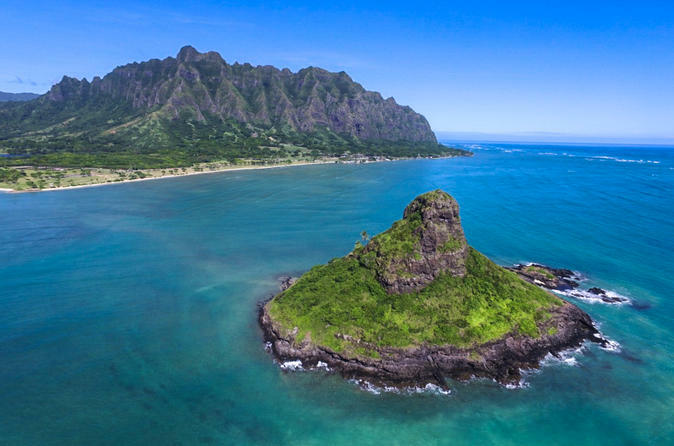 Our next stop is Makapu’u Lookout where you will see the island's most recent lava flows, and enjoy incredible panoramic views of offshore islands, turquoise and azure ocean water and breathtaking lava cliffs above. Driving North we arrive at the Valley of the Temples and visit the colorful Byodo-in Temple, a photographer's dream. Laie Point is our next stop. Here you can see native Hawaiian coastal plants and birds and Kukuihoolua, the famous puka island with a hole in its center. We stop for lunch at Fumi’s Shrimp Stand on the North Shore where you will be served your choice of nine different sauteed shrimp plates with steaming rice and a delicious, shave-ice treat. Throughout your journey of discovery around the island of Oahu your nature guide will provide a fascinating narration about Hawaii's bird and plant species, geology, history and culture.